Pre-requisite: Students must take the Personal Protection In the Home Class before taking the Personal Protection Outside the Home Class. Course Goal: This course is designed to help develop the student’s knowledge, skills, and attitude essential for avoiding dangerous confrontations and for the safe, effective use of a concealed handgun for self-defense outside the home. 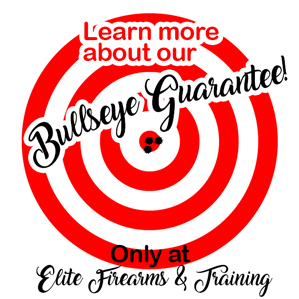 This class is divided into three classes – Two days in the classroom and one full day on the range, equaling a total of eighteen hours. The cost is a flat fee of $200 per person. Students will be given an NRA packet, including the NRA Basics of Personal Protection Outside the Home book. Students must be 21 and older to take this course. Students must have completed the Personal Protection Inside the Home first. Classes will take place in an indoor, temperature controlled classroom located at 1322 N. Academy Blvd. Suite 203. Range time takes place at an outdoor range. Interested in having a private class with family and friends? Groups four or more can do so! Contact Elite Firearms to set up a date. There are no upcoming classes but if you are interested, please click here to contact us and let us know!